We are busy inside of school, and outside of school. During the school day, we are teaching lessons, wiping noses, tying shoes (jk, I don't tie shoes haha), tracking down lunches, writing notes in agendas, mediating conflicts, and loving our students as if they are our own. After school (and often before school), we are planning, prepping, answering emails, attending meetings, and you know, trying to live our lives. We have lots to teach! 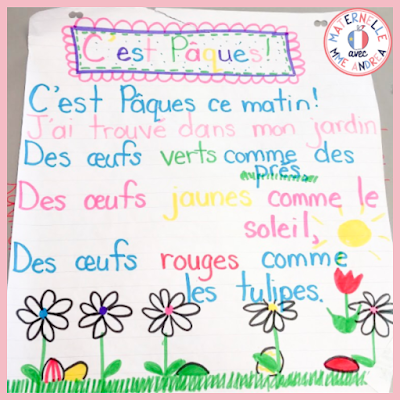 In maternelle especially, we have so many things to teach that don't even necessarily fall under curriculum... but we know that our students won't be really ready for learning until these things are addressed. Sometimes, we spend all of September and October just helping our students learn how to follow a routine and open their lunch containers... and then, suddenly it's Christmas and we feel like we haven't taught anything at all. At this time, if you're anything like me, you might start to feel some pressure. You might start to want to rush. These kiddos need to learn to read! They need to write! They need to count and speak and listen! They need to be ready for grade one, and time is running out!!! This blog post is a reminder (for you, but also for me - I have a habit of looking back on old blog posts to see what I was doing in previous years when I start to feel lost) that it's okay to go slow. Some skills (especially pre-reading skills) might seem really obvious and like every student should know them. We can probably skip those, right? We can work on them in small groups later, but students who are "ready" to read need to start reading! Like rhyming - surely every 5-year-old can rhyme?? We can put up a quick anchor chart and talk about it for five minutes, and they'll get it. Rhyming is mega important, and a crucial skill to develop in your maternelle students. Luckily, it doesn't take a lot of time to practice, but you've gotta do it. Over and over! I didn't always realize how important it was, and I must admit that I didn't always spend as much time on it as I should have. But, I am always trying to grow and improve as a teacher, so I figured I should look more into it. Everyone kept saying that rhyming was important, but no one was really saying why. But, I did some research, and now I can share that info with you! The first interesting piece of information that I found had to do with the correlation between rhyming and reading readiness. Did you know that knowing their nursery rhymes is a predictor to how well your students will learn to read?? Who knew that all of the times I made my mom recite "One, Two, Buckle My Shoe" with me as a child would help me become a strong reader? But, there are lots of other reasons why rhyming is important, as well. When you are being silly with your students and encouraging them to think up/make up rhymes, you are giving them permission to have fun with and manipulate language. When they are encouraged to play with words and sounds, your students will feel more ownership over their language. This could also lead to an increase in confidence if French is their second language, and confidence is lacking! As I said above, playing with rhymes encourages your students to play with and manipulate sounds within words. But, before they can manipulate them, they first need to notice them. Noticing sounds within words can help students better understand how the language works, and help them find and recognize patterns within or similarities between words. This is very important when learning a second language, as different languages can have different rhythms. When you recite rhyming comptines and poems with your students, they will learn how to vary the pitch of their voices, and how to animate their voices. They will learn which syllables and words to stress, and which groupings of words go together. This will also help with their expression and their fluidité later on, as they learn to read. Rhyming doesn't only help with expression when learning to read, but it can help with other aspects of reading and writing, too. Early literacy skills are listening and speaking, not reading and writing - speaking and listening are the foundations for learning to read and write. This means that listening to and reciting rhyming songs, poems, and stories lay a fantastic foundation for our students as they become ready for reading. Also, rhyming is an aspect of phonemic awareness (how to listen to/identify/switch around sounds in spoken language). Strong phonemic awareness skills are essential for students who are trying to learn to read! Rhyming can also help students who are ready to write, because words that share sounds often share letters as well. Plus, poems, songs, and stories all help increase your students' vocabulary, which makes for better writing. Rhyming adds fun and joy to learning to hear sounds within words. Students love being silly with rhyming nonsense words, and listening for rhymes within their favourite songs and stories - like La vie secrète des bonhommes de neige, for example. Familiarity with rhyming books, songs, and poems can help children become able to anticipate the rhyming word that comes next. This can help lead to your students making predictions when reading. Rhyming songs and poems can even help with visualizing. When listening to rhyming songs and stories, children make pictures with their minds. This expands their imagination, and helps sharpen their concentration and comprehension. Doesn't this Easter comptine have you imagining a beautiful garden full of colourful, hidden eggs? 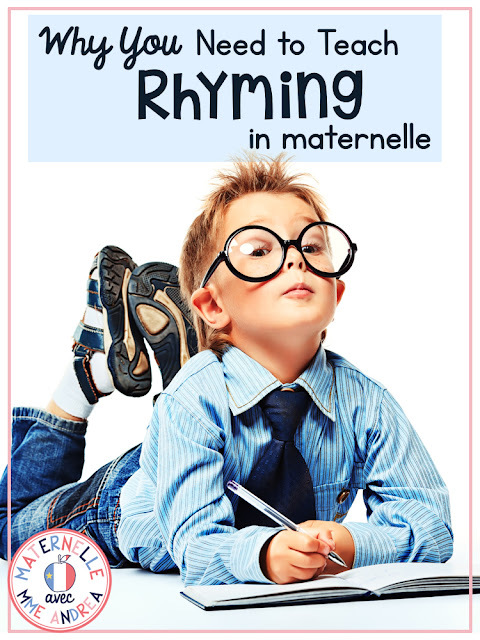 There are just so many reasons why you shouldn't skip over rhyming as a maternelle teacher, no matter how far behind you might feel. If your students first have the foundation they need, they will learn to read when they are ready! 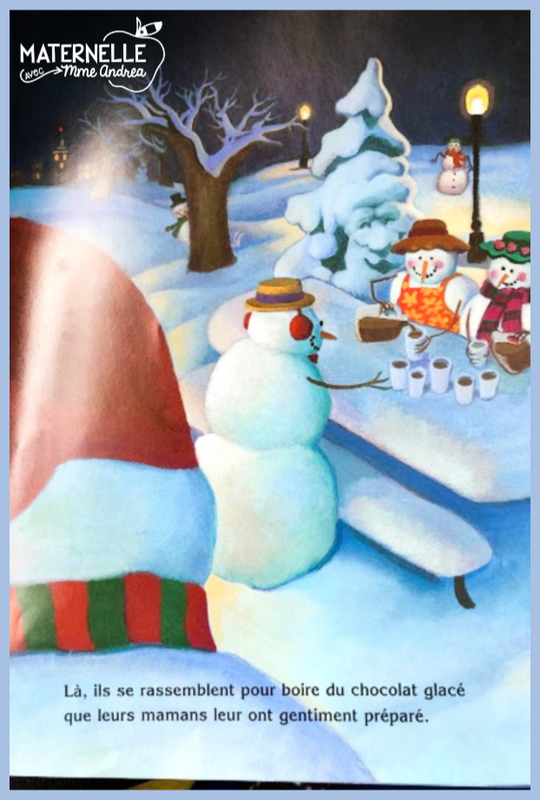 Take the time to explore nonsense rhymes and sing silly rhyming songs and read beautiful rhyming books with your students. It's okay to go slow - just like your students need to know the routine at the beginning of the year before they are ready to learn outcomes, they need to know how to rhyme before they are ready to learn to read.